The venue is just a short walk from Leicester Railway Station and close to De Montfort Hall and Victoria Park, where parking is available. Claire Carroll, Senior Practitioner Educational Psychologist with One Education Ltd, Manchester. Claire will be presenting on ASD & SM. Other presentations will be announced shortly. SMIRA is very sad to announce that our Founder, Alice Sluckin OBE, passed away in Norwich on 15 February 2019 at the age of 99 years. Over the years she has touched many people’s lives and will be remembered by everyone who knew her with admiration and affection. She leaves two sons and a number of grandchildren. 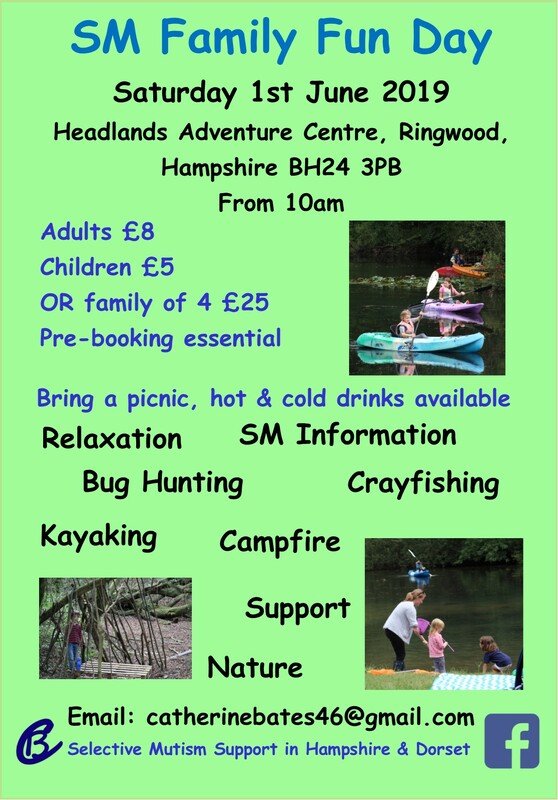 Bring a picnic, hot and cold drinks available. The aim is for this to be a relaxed day in an environment where everyone “gets” SM. There will be no expectation to speak but it is hoped that the relaxed atmosphere will help SMers to feel comfortable. There will be opportunities to do a variety of activities including kayaking, crayfishing, bug hunting as well as simply relaxing together. As this is a poular holiday area, there is plenty of accomodation locally for those of you who want to come from further afield! SMIRA Christmas Shop Now Open! Stock up for Christmas with our lovely Christmas cards, gifts and decorations! All profits go to SMIRA. For those of you in the UK: Nominations have now opened for the Shine-A-Light Awards 2019, which includes the Katie Rough Memorial Award for Selective Mutism. Can we please ask you all to think hard about anyone who has gone out of their way to help your child over the last year, or perhaps a member of your team who has gone that extra mile, and consider whether they would be suitable for nomination. This is a prestigious award – we need your nominations! The Shine-a-Light Awards are given annually by Pearson Educational in conjunction with The Communication Trust. They are open to schools, teams, young people and individuals who champion innovative work and excellent practice in supporting children and young people’s communication development. This year SMiRA was pleased to be involved with the Katie Rough Memorial Award for innovative, inspirational or excellent practice when working with children or young people affected by Selective Mutism. Katie Rough was selectively mute and just 7 years old when she tragically died and this award was given in her honour. Her parents, Paul & Alison Rough, joined representatives of SMiRA at the Awards Ceremony, hosted by comedian Adam Hess. You can also view the video on the Pearson Clinical website or on You Tube. Our 2018 Conference took place on 21st April in Leicester (after postponement due to the bad weather in March). It was fully attended and was a great success. Many thanks to all contributors and attendees. 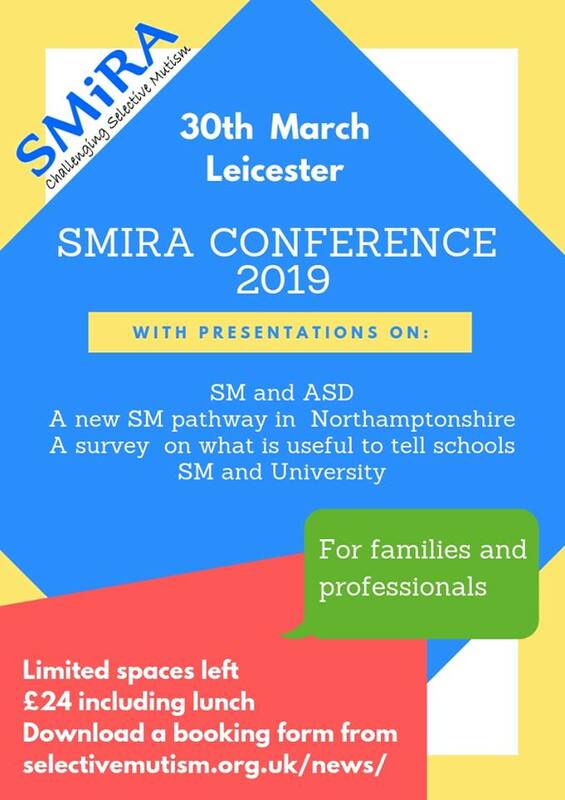 The Conference is open to parents, professionals and anyone with an interest in Selective Mutism. Anna Biavati Smith, Speech & Language Therapist and member of the RCSLT Clinical Excellent Network for Selective Mutism. Anna will be presenting on techniques to help lower anxiety. Claire Neal, Parent & Primary School Teacher. In her dual role Claire is able to see Selective Mutism from both sides and will include tips on how to approach school in her presentation. Do you know someone who has done great work in helping children and young people (age up to 25) with Selective Mutism? 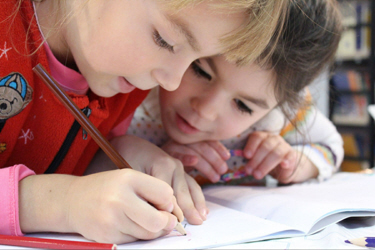 Nominations are now open for this award, which is open to all settings, organisations, services and individuals in England for innovative, inspirational or excellent practice when working with children or young people affected by Selective Mutism. The closing date is January 12th and those nominated must give their consent and agree to any publicity. The award was proposed by SMIRA in memory of Katie Rough, who had Selective Mutism and sadly died in January 2017 at the age of just 7. SMIRA’s activities for Awareness Month 2017 will be concentrated on the Facebook group. It is a very active and supportive group, so please feel free to join us there! SMIRA’s 2017 Christmas Card Competition for Selective Mutism Awareness Month!! SMIRA hopes to offer Christmas cards for sale this year, as they are a great way of keeping the awareness raising going into the New Year. We know that a number of our families are quite artistic, so we would like members and site visitors to try and design the cards for us! The finished cards will be 14cm x 14cm, but designs can be reduced or enlarged as appropriate. Drawings, paintings or photographs are all acceptable and entries should be sent by email to smira.leicester@ntlworld.com by the closing date of 21st October 2017. If you would prefer to send your designs by post, please contact us for details. Watch this space for news of other competitions!